Born at Columbia, Louisiana, June 28, 1897, he graduated from Louisiana State University in 1917. He entered the Marine Corps in 1917 and advanced through the grades to General. He served at Pearl Harbor; was Chief of Staff of the Amphibious Group, Atlantic Fleet and other related duties. He led the assault on Iwo Jima in 1945 and also at Guam in 1945. After World War II, he was the commander of the Marine Base at Camp Pendleton, California, 1950; Commanding General, Fleet Marine Force, Atlantic, 1951-53; and retired from active duty in 1953. He then served as an assistant to the Secretary of Defense, 1953-61. He died on May 21, 1973 and was buried in Section 5, Grave 7033, of Arlington National Cemetery. 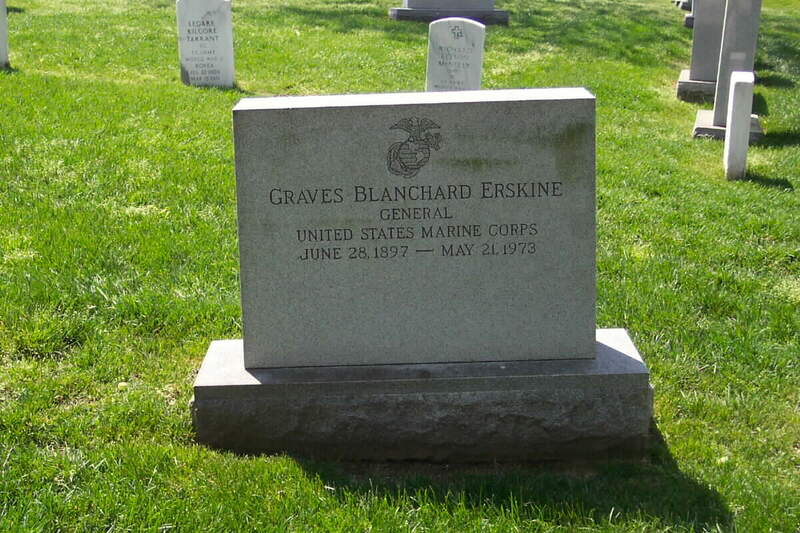 Graves Blanchard Erskine, four-star General of the U. S. Marine Corps and Former Assistant to the Secretary of Defense, as Director of Special Operations, died May 21, 1973 at the National Naval Medical Center, Bethesda, Maryland after a prolonged illness. 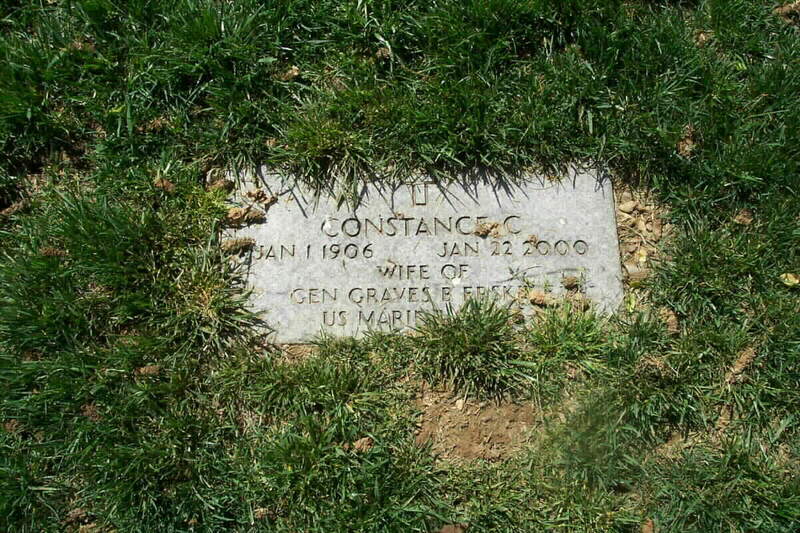 Interment was May 24, 1973 in Arlington National Cemetery. Upon retirement from active duty in the Marine Corps, he was advanced to four-star rank July 1, 1953. General Erskine was authorized to retire from active service by a Special Act of Congress in June, 1953 for the purpose of accepting the position as Assistant to the Secretary of Defense, serving under the late Secretary Charles E. Wilson, the late Secretary Neil McElroy, Secretary Thomas S. Gates, and Secretary Robert McNamara. He retired from this post on October 31, 1961 and had received the civilian Distinguished Service Medal from Secretary of Defense Thomas S. Gates. Also during this period, Operation Deep Freeze was conducted under his supervision from 1955 to 1961. In 1957, Admiral Richard E. Byrd, on his last mission to the Antarctic named a bay there "Erskine Bay" in his honor. Born June 28, 1897 in Columbia, Louisiana, the oldest child of Benjamin Eldridge Erskine and Daisy Graves, he attended schools there, graduating from high school at the age of fifteen, and was valedictorian of his class. Entering Louisiana State University in the fall of 1912, he joined the National Guard and in 1916 saw duty on the Mexican border. When he graduated in June of that year, he joined the Marine Corps, and was sent to France where he participated in the Aisne-Marne, Chateau-Thierry Offensive. He was wounded at Bellau Wood, but went on into the St. Mihiel Offensive where he was so seriously wounded that he was evacuated home where he spent a year in the hospital, undergoing nine operations. For bravery in action, he was awarded the Silver Star Medal, and was cited by President Woodrow Wilson, the American Expeditionary Forces, and in General Orders of the War Department. Upon his return to active duty, he was chosen to organize the Honor Guard that returned the body of the Unknown Soldier from France aboard the USS Olympia. After an extremely stormy Atlantic crossing which necessitated re-securing of the coffin on the afterdeck of the ship at the height of a violent storm, the Olympia finally reached American shores, and proceeded up the Potomac River in Washington, D. C. where it was met by General John J. Pershing and General John A. Lejeune who conducted the ceremonies. General Erskine served at several Marine Corps posts in the United States, as well as in Haiti, Santo Domingo, Cuba and Nicaraga. In 1929 he was sent to the Officers Staff College in Fort Leavenworth, Kansas and upon completing the two year course, was sent to teach at the Marine Corps Schools, Quantico, Virginia, where he remained until he was ordered to Peking, China. There, he was Executive Officer to then Colonel A. A. Vandegrift (later General Vandegrift, Commandant) from 1935 to 1937. Soon after the Panay incident there, he was ordered home, proceeding again to duty in Quantico, Virginia, where he served when Japan attacked Pearl Harbor on December 7, 1941. The youngest Brigadier General in the Corps, he was made Chief of Staff, Amphibious Force, Atlantic Fleet1 but he was soon sent to Pearl Harbor, where he was Chief of Staff and Deputy Commander of the Amphibious Corps, Pacific. It was organized in September, 1943, and General Holland M. (Howling Mad) Smith commanded. General Erskine, already affectionately known as the "Big E", participated in planning the seizure of the Gilbert Islands (Tarawa) and accompanied the assault forces which took Kwajalein, Saipan and Tinian in 1944. It was in this post that he pioneered many of the doctrines for amphibious warfare which overwhelmed the enemy in the Pacific. For this work, he was awarded the Legion of Merit by Fleet Admiral Chester W. Nimitz. In October, 1944, he assumed command of the 3rd Marine Division and commanded it during the hard-fought campaign on Iwo Jima in February and March, 1945. Units of this division were then awarded the Presidential Unit Citation for heroism, and General Erskine was awarded the Navy Distinguished Service Medal. His citation reads in part, "Landing with his division on February 24, 1945, in support of the assault divisions, he quickly assumed control of a difficult sector of the line, and through his brilliant, skillful and.inspiring leadership, kept his division in the forefront of the assault, finally breaking through to the north coast of the island, and thereby splitting the enemy into two groups. His dynamic force and personal courage were in great measure responsible for the success of his Division and the entire operation." Aware of the part the 3rd Marine Division played in winning Iwo Jima, the Army Air Force named a B-29 Superfortress the "3rd Marine Division", making General Erskine the "Honorary Plane Commander" on the first American B-29 mission over Japan. This was July, 1945. 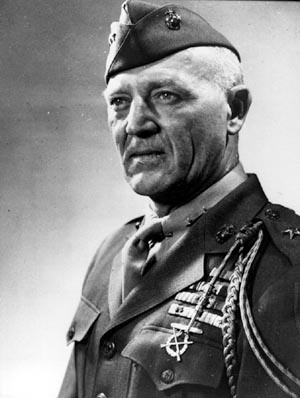 Immediately after cessation of hostilities in the Pacific, as Commanding General of the 3rd Marine Division on Guam, General Erskine, realizing that many of the Marines under his command had joined up directly from schools and were ill-equipped for proper re-integration into civilian life upon discharge, organized vocational schools, using the available instructor talent under his command, teaching postwar trades and skills to his men. Secretary of Defense James E. Forestal, on a postwar inspection trip to Guam, was deeply impressed with this program and returned posthaste to Washington D. C. where he reported his observations to General George E. Marshall, Secretary of the Treasury John W. Snyder and President Truman. As a consequence, General Erskine was ordered to Washington, Priority One, and as a result of a Special Act of Congress, was appointed by President Truman in October, 1945 to be Administrator for the Retraining and Re-employment Administration, Depart of Labor. He remained in this post for two years establishing among other organizations, "The President's Committee for the Employment of the Handicapped". Upon completion of his assignment, he shocked the Congressional Budget Review Committee when called before it to justify his budget for the forthcoming year by reporting that he was requesting no funds, and recommended that the activity be discontinued, inasmuch as the useful purpose for which it had been organized could now be routed to other existing agencies. Returning to the Marine Corps, General Erskine assumed command of the 1st and 3rd Marine Divisions at Camp Pendleton, California, remaining until June, 1950, when the Office of the Secretary of Defense issued a call for the already recognized abilities of General Erskine. This appointment placed upon him the title of "Chief of Military Group, Melby-Erskine Mission", a joint State Department-Defense Department Mutual Defense Assistance Program survey mission to Southeast Asia. In carrying out their assigned duties, Dean Melby and General Erskine travelled through the Philippine Islands, French Indo-China, Malaya, Thailand, and Indonesia, revisiting some countries to complete their surveys. While on this trip, the Korean War broke out, and General Erskine asked to be relieved of his assignment so that he might take the 3rd Marine Division to Korea. This request was denied, and upon completion of the mission, Secretary of State Dean G. Acheson wrote in part: "The Department of State deeply appreciates the important part which Major General Graves B. Erskine played in assuring the successful accomplishment of the mission's objectives. The selection by the Department of Defense of such an able and outstanding officer, as the principal military member of this group, added greatly to the effectiveness of the mission. Departmental review of the voluminous and exhaustive reports which were submitted by the mission has emphasized the care, thoroughness and skill with which General Erskine performed his task throughout the trip... I wish to commend the outstanding performance of General Erskine and thank you for making him available to the Department of State". The official report submitted by General Erskine is still required reading for all officers assigned to that area. While doing the survey, General Erskine became personally acquainted with many of the key officials throughout the area, and gained a good understanding of the situation which exists in those countries. During his stay in Indonesia, he was made an honorary member of two French Foreign Legion units, one North African unit, and the First French Marine Regiment. In the absence of the King of Cambodia, the Regent ceremoniously made him a "Khmer Soldier" in Phnom Penh. Seven years later, the then Prime Minister of Thailand, Sidahi Thanarafata, "gave" his son, Sother, to General Erskine to be his foster son from that time forward, as the highest possible personal gesture. Following the Melby-Erskine Mission, General Erskine was advanced in rank to Lieutenant General, and was named Commanding General of the Fleet Marine Force, Atlantic, with headquarters in Norfolk, Virginia. During this tour of duty he built the airfield on Vieques Island. From June, 1953, until October, 1961, General Erskine's duties in the Office of the Secretary of Defense took him to various parts of the globe. In October, 1954, following his marriage to his second wife, his first marriage having ended in divorce, he was asked by the Under Secretary of State, Herbert Hoover, Jr., to accompany him as an observer to the Pan American Economic Conference, and this became a honeymoon trip as well. Mrs. Erskine thereafter accompanied him on the fifteen trips around the world, and the frequent trips to Europe as well as the ones in the United States that the General made while in the Defense Department, and later for the companies with whom he was associated. During General Erskine's tenure at the Defense Department, he was instrumental in bringing King Constantine of Greece, then the Crown Prince and Duke of Sparta, to the United States for certain training. General and Mrs. Erskine served as his escorts for a tour of America, and they became good friends. When King Constantine was married to Princess Anne-Marie of Denmark, they were distinguished guests at the wedding. After the week's festivities and the wedding ceremony, they were official guests of Malaysia and Thailand and also visited Japan, Korea, and the Philippines. He became Executive Consultant for Beckman Industries of Fullerton, California, on October 31, 1961 and remained with that firm for five years. Later, he joined Dyna-Therm Corporation of Los Angeles, California, remaining there for three years. From 1968 until the time of his death, he was employed by Northrop Corporation, of Los Angeles, and Zerox Corporation of Maryland. Awards to General Erskine included the "Knight Grand Cross, Most Exalted Order of the White Elephant" presented to him by the King of Thailand, the Order of King George I, presented to him in the absence of the late King Paul, by his son, the Crown Prince, and Duke of Sparta. In addition to the Distinguished Service Medal, Silver Star and Legion of Merit with gold star and Combat "V", his decorations and medals included the Purple Heart with Palm, France, 1918; Victory Medal with Aisne, St. Mihiel and Defensive Sector Clasps, France, 1918; Expeditionary Medal with one bronze star, Haiti, 1921; Santo Domingo, 1924; Second Nicaraguan Campaign Medal, 1928-1930; American Defense Service medal with base clasp; American Campaign Medal; Asiatic-Pacific Campaign Medal with four bronze stars; Victory Medal, World War II; Nicaraguan Medal of Merit, 1928-1930; the French Fouragere, 1918; and the Presidential Unit Citation with bronze star. He was in addition an Honorary Chieftain in the Cherokee Indian Tribe, and a Kentucky Colonel.